Sean Stewart is the nomination for Shadow Ridge High School’s Star Graduate. While at Shadow Ridge High School, Sean has maintained 4.5 GPA including AP and Honors level courses. In addition to academic achievement, Sean works as editor in chief of The Lariat, our school newspaper, plays on the men’s varsity soccer team and does community service during his free time. Each summer, he volunteers with Families for Effective Autism Treatment’s summer youth camps. Additionally, he’s a member of the National Honor Society and the National Society of High School Scholars. 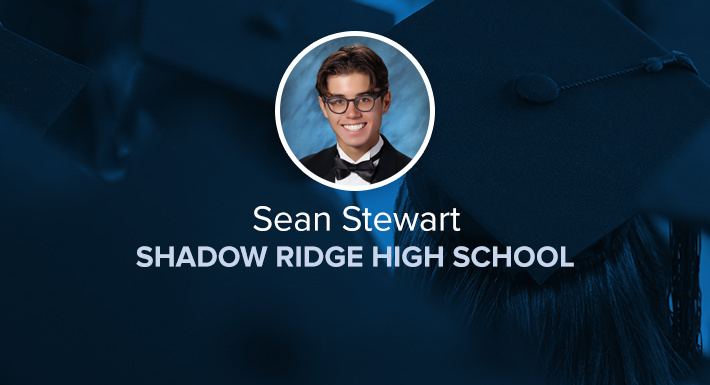 Besides the academic achievement and his involvement in school and community organizations, Sean Stewart will graduate this May from Shadow Ridge High School with a perfect attendance record across 12 years.